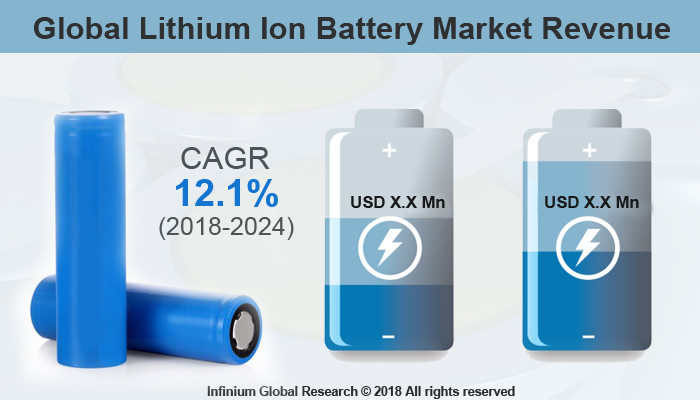 A recent report published by Infinium Global Research on lithium-ion battery market provides an in-depth analysis of segments and sub-segments in global as well as regional lithium-ion battery market. The study also highlights the impact of drivers, restraints and macro indicators on the global and regional lithium-ion battery market over the short term as well as long term. The report is a comprehensive presentation of trends, forecast and dollar values of global lithium-ion battery market. According to the report the global lithium-ion battery market is projected to grow at a CAGR of 12.1% over the forecast period of 2018-2024. The lithium-ion battery is also known as Li-On batteries is a form of rechargeable batteries with high energy density mostly used in the consumer electronics and automotive applications. In this, the Lithium-ion battery, during the discharge, the lithium ions flows from the negative electrode to the positive electrode and vice versa. The lithium-ion battery is the most adopted form of rechargeable batteries for portable electronic devices as they offer, lightweight, high energy density, low self-discharge and miniscule memory affected as compared to the other tradition batteries that have the same size. The rapidly growing use of lithium-ion batteries in the consumer electronics drives the growth of Lithium-ion batteries market. The benefits of the lithium-ion battery over the other tradition batteries include high energy density, Low self-discharge level and longer shelf life so they are vastly used in the consumer electronics. In addition, the adoption of the lithium-ion battery for the automotive sector in hybrid and electric vehicle are rising with the faster rate that is likely to boost the demand of the lithium-ion battery market. Furthermore, the factors such as the growing renewable energy sector and favorable government policies are expected to contribute to the growth of lithium-ion battery in upcoming years. Furthermore, the use of lithium-ion batteries in the aerospace and the defense sectors is rising very rapidly than anticipated to escalate the growth of lithium-ion battery market. The properties offered by the lithium-ion battery such as low weight, high efficiency, and high energy density and others they are vastly replacing the led ion batteries in the aerospace and defense sectors. However, the problem associated with battery overheating is expected to restrain the growth of the lithium-ion battery market. Moreover, rapidly growing technological innovations in the lithium-ion battery technologies are projected to create several opportunities in the lithium-ion batteries market in upcoming years. The declining prices and the offered advantages of lithium-ion batteries are increasing consumer inclination towards the adoption of lithium-ion battery in the new applications that are anticipated to serve the tremendous prospects for the lithium-ion battery market over the forecast period. Among the geographies, Asia Pacific is the largest and the fastest growing region in the lithium-ion battery market. The rapidly growing consumer and the automotive sectors are driving the growth of the lithium-ion battery market in the Asia Pacific. In addition, the growing demand for the efficient battery storage system in the Asia Pacific region owing to the growing industrialization and urbanization is likely to boost the growth of the lithium-ion battery market in this region. The report on global lithium-ion battery market covers segments such as types, power capacity, and application. On the basis of types, the global lithium-ion battery market is categorized into lithium cobalt oxide, lithium manganese oxide, lithium nickel manganese cobalt oxide, lithium nickel cobalt aluminum oxide, and lithium iron phosphate and lithium titanate. On the basis of power capacity, the global lithium-ion battery market is categorized into 0 to 3000mah, 3000mah to 10000mah, 10000mah to 60000mah and others. On the basis of application, the global lithium-ion battery market is categorized into consumer electronics, automotive, energy storage, industrial and others. The report provides profiles of the companies in the global lithium-ion battery market such as Panasonic, BYD Co., LG Chem, Samsung, GS Yuasa Corporation, Hitachi, Toshiba Corporation, China BAK Battery Co. Ltd, Automotive Energy Supply Corporation (AESC) and Johnson Controls. The report provides deep insights on demand forecasts, market trends, and micro and macro indicators. In addition, this report provides insights into the factors that are driving and restraining the global lithium-ion battery market. Moreover, IGR-Growth Matrix analysis given in the report brings insight into the investment areas that existing or new market players can consider. The report provides insights into the market using analytical tools such as Porter's five forces analysis and DRO analysis of lithium-ion battery market. Moreover, the study highlights current market trends and provides forecast from 2018-2024. We also have highlighted future trends in the lithium-ion battery market that will impact the demand during the forecast period. Moreover, the competitive analysis given in each regional market brings insight into the market share of the leading players. This report will help manufacturers, suppliers, and distributors of the lithium-ion battery market to understand the present and future trends in this market and formulate their strategies accordingly.